New pictures of an Aston Martin Vanquish Zagato test mule have emerged, suggesting the limited-run super-coupé’s engine and chassis are being finalised ahead of production commencing at the start of 2017. 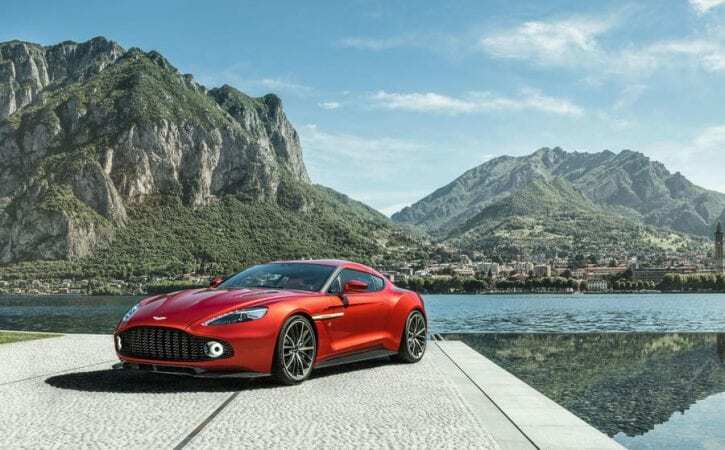 Based on the regular Vanquish, the Zagato features a more potent version of that car’s 5.9-litre V12 engine with an extra 24bhp, taking the peak output to 592bhp. The Zagato is capable of accelerating from 0-62mph in a claimed 3.5sec, three-tenths of a second faster than before. The production Zagato will get restyled bodywork crafted entirely from carbonfibre (shown below), but this test mule is running the regular Vanquish’s exterior, suggesting it is focused on testing technical settings rather than fit and finish. Although Aston Martin hasn’t revealed what chassis changes will be made compared with the regular Vanquish, insiders have suggested the Zagato will get a stiffer, more agile set-up to handle the extra power. Some sources have said this mule could also be back out on the road as Aston Martin will base a future Vanquish S model on the Zagato’s settings, but our insiders say these claims are so far unfounded. Evidence for this comes from the fact the next-generation Vanquish is expected to arrive in 2018, using an adjusted version of the DB11’s turbocharged V12 engine and new architecture. This leaves little time for Aston Martin to work on another version of its outgoing model.